Two police officers were taken to hospital and three others were injured in an assault at Newcastle Airport. The incident happened at 6.50am this morning when three police officers and a two members of airport staff were detaining a man. He became aggressive and assaulted the officers and staff causing injuries. Two officers have been taken to hospital and all three are receiving treatment. 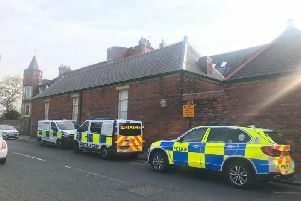 A 32-year-old man has been arrested and remains in police custody. Chief Inspector Ron Charlton said: "The safety of our officers and staff, and indeed the wider public, is paramount to us, and we will not tolerate any violence towards our officers. Enquiries are ongoing into this incident and anyone who saw what happened is asked to contact us with information. Police are appealing for anyone with information to contact them on 101 quoting reference 181 24/12/15 or call the independent charity Crimestoppers on 0800 555 111.